A male yellow warbler searches for caterpillars in the blossoms of an old apple tree at the Westboro Wildlife Management Area off Route 135. Birdwatchers get excited when colorful wood-warblers pass through eastern Massachusetts on their northward spring migration in May, but yellow warblers come to Westborough to stay for their brief breeding season. Most of us are used to thinking “goldfinch” when we catch sight of a bright yellow bird, but if you’re out walking Westborough’s trails at this time of year (as opposed to enjoying the show at a birdfeeder), look again. You might have glimpsed a yellow warbler (Dendroica petechia). The aptly named yellow warblers are small birds, about the size of a chickadee. At this time of year, both male and female basically look all yellow. The males have reddish streaks on their breasts, while females have mostly clear yellow breasts. 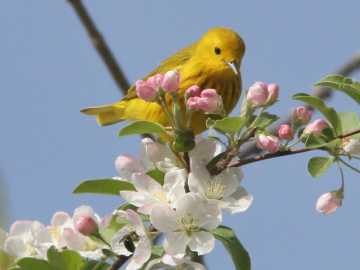 By mid-May, yellow warblers have already arrived in our area to breed. Many other kinds of warbler head for the insect-rich north woods of New Hampshire, Maine, and Canada, but yellow warblers find what they need right here in Westborough. Look for them in shrubby areas close to water. Thickets provide protective cover for their nests, and abundant caterpillars and spiders on the leaves of willows and other plants near streams and ponds are a good food supply for yellow warblers and their young. Keep your eyes open for yellow warblers at Mass Fish and Wildlife’s Westboro Wildlife Management Area (off Rte. 135 near the Northborough line), especially near the ponds and brushy areas. Another promising area to check is the brushy area and stream near the town well on Hopkinton Road (Rte. 135 on the way to Hopkinton). We only get to enjoy yellow warblers for a limited time. They get busy nesting and breeding when they arrive in May, but they finish by mid-July. They start moving south just when we’re beginning to enjoy summer. During their few short months here, they typically raise one brood. Yellow warblers stake out relatively small breeding territories of one-half to three acres, so if you spot a yellow warbler or a pair, chances are good that you’ll be able to watch them flying around the area. If your ear is attuned to birdsong, the male’s loud, cheerful song (beginning with “sweetsweetsweet”) can help you locate him as he moves around the territory. The female yellow warbler builds the nest, usually in an upright fork of a shrub or small tree. You may notice her flying with nesting material, perhaps with the male trailing after her. In their nests, yellow warblers use all sorts of soft plant materials from the vegetation that grows in the damp areas near water, such as fluff attached to willow seeds and fuzz from stems of cinnamon fern. One of their favorite materials is the silk from tent caterpillar nests, often found in saplings of wild cherry. You might see a yellow warbler helping herself to this prized material. After the female has completed the nest, she lays about 5 eggs, one per day. She starts sitting on the nest full-time about when the last one is laid, warming all the eggs together so that all hatch together. Sometimes, yellow warblers return to their nest during the egg-laying period and find a surprise – an egg that doesn’t belong. Brown-headed cowbirds (Molothrus ater) are famous for laying their eggs in other birds’ nests, and they commonly choose yellow warbler nests. Estimates suggest that cowbirds lay eggs in as many as 30-40 percent of yellow warbler nests. Not surprisingly, you can spot brown-headed cowbirds at the Westboro Wildlife Management Area. Males look like shiny blackbirds with brown heads, and females are dull gray-brown, much like female blackbirds. Instead of building their own nests, female cowbirds watch other birds to see where their nests are. Then, in the early morning when the other birds are away from their nest, the cowbird quickly lays an egg of her own in it. That’s the end of the cowbirds’ parental duties. The next day, she’ll lay another egg in a different nest. Altogether, a female cowbird lays lots of eggs – about 40 eggs per season. Her energy goes into producing eggs instead of nesting and caring for eggs and young. What do yellow warblers do when they find a cowbird egg in the nest? Most other birds treat a cowbird egg like one of their own, but yellow warblers often desert their nest and start over. Sometimes they simply build a new nest right on top of the old one, covering the cowbird egg and their own eggs. Or they’ll build a new nest elsewhere in the territory. If the yellow warblers happen to treat the cowbird egg as one of their own, they end up raising a cowbird chick. Not only are cowbird eggs larger than yellow warbler eggs, but cowbird chicks also grow faster and larger than young warblers. It’s a challenge for the yellow warblers to feed a large cowbird chick along with their own young, but that’s what they proceed to do. By the time the cowbird chick is ready to leave the nest, it’s even larger than the yellow warbler adults. In spite of this scenario, cowbirds don’t necessarily produce a large number of young. Out of the 40 or so eggs that a female cowbird lays each year, only two or three usually survive to become adult birds. After young yellow warblers leave the next, they stay in the territory for about two weeks while the parents continue to feed them. Then the yellow warblers pairs split up and go their separate ways. They migrate south to Central and South America, with females leaving first. The trip takes about a month. The birds spend about seven months on their distant wintering grounds. If you’re fortunate enough to see a yellow warbler, enjoy the sight while you can. And remember to look in the same place next year. Yellow warblers tend to return to breed in the same area each year, and the pairs often reunite when they arrive.